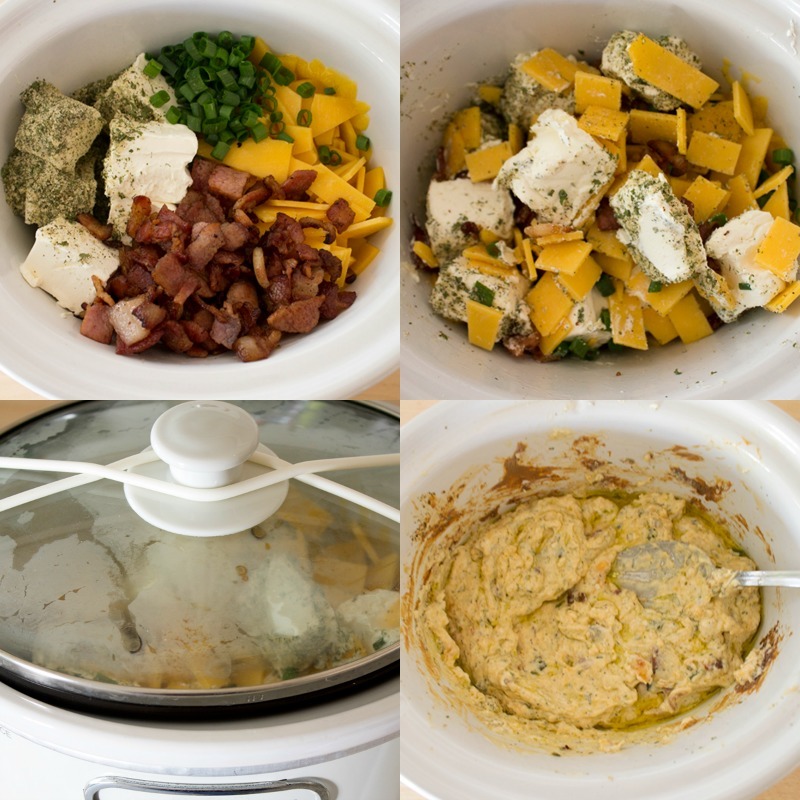 Slow Cooker Bacon Ranch Dip is my go to dip for game day. 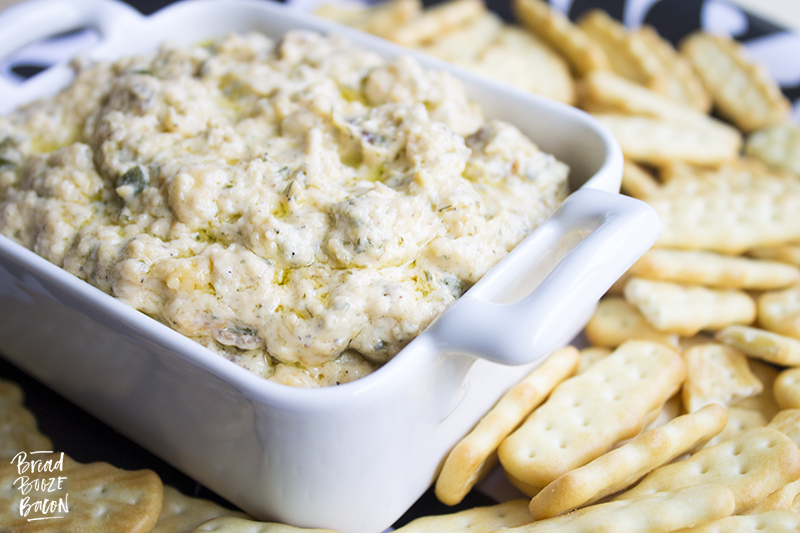 Super cheesy and studded with bacon, this easy to make dip is always a crowd pleaser! 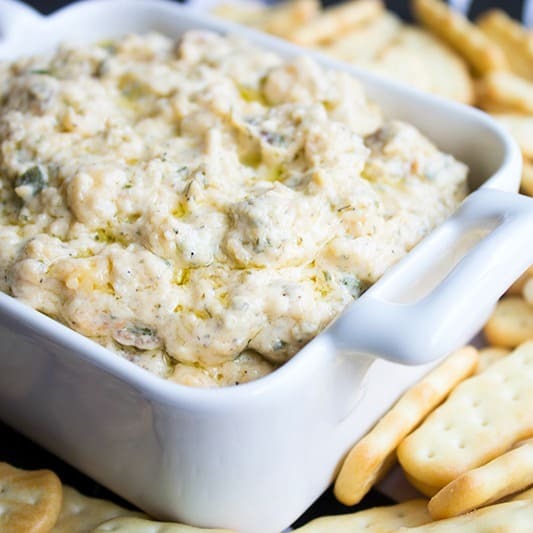 In case you haven’t noticed, I have this crush on Appetizer Dip Recipes. 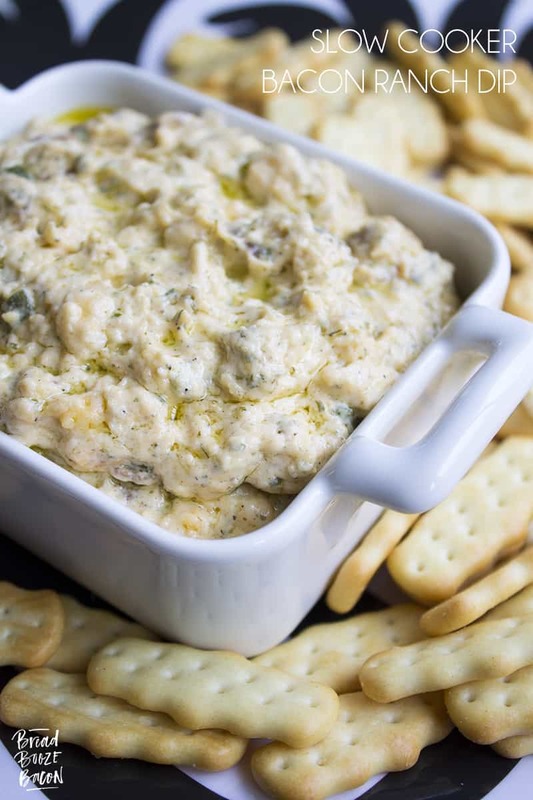 They’re usually super easy to make and in my house, they’re almost always loaded with cheese and delicious and… *insert Homer Simpson level drooling here* This slow cooker dip recipe is no exception. 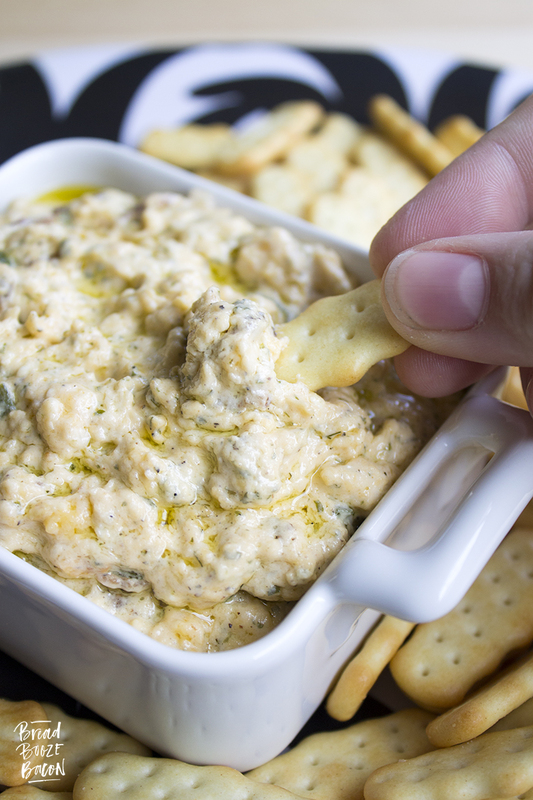 It combines my love of all things bacon and ranch into a cheesy dip that’s perfect for parties, having your friends over to watch the game, or weekend snacking. I went ahead and used cheddar cheese when I made this dip the first time. You will get little pools of the fat from the cheese on top of your dip. You’ll live. Give it a quick stir and voila! Option B is to substitute Velveeta in for the cheddar cheese. The dip may take a little longer to completely melt, but it’ll taste just as good as the original recipe. Now, if you’re a member of the bacon freaks club like me, you are going to LOVE hanging out around my site this month. 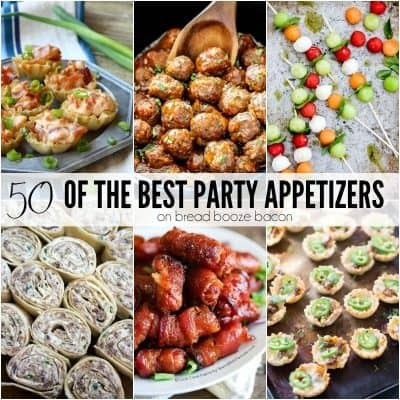 Every August, I gather up some of my food blogger friends and we go balls to the wall all month sharing crazy good bacon recipes that’ll blow your mind. 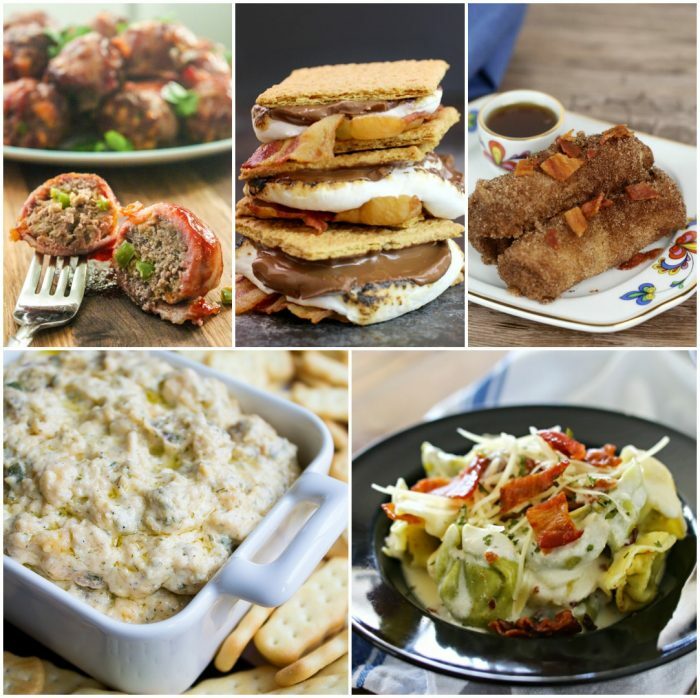 You can see all the recipe being shared this month by heading over to the Bacon Month page! Place all the ingredients in a 1.5-quart slow cooker. (A bigger one is fine too.) Stir ingredients together and cover. Cook on HIGH for 1.5 hours, stirring occasionally. Turn your slow cooker to warm and keep covered until ready to serve. Velveeta would also work in place of the cheddar cheese in this recipe.